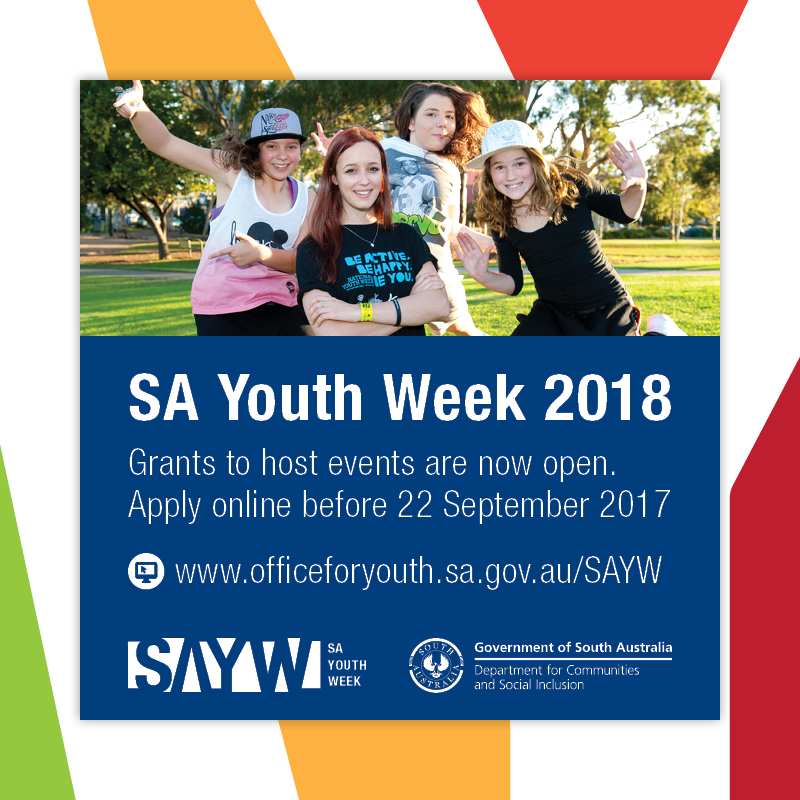 Councils and organisations working with young people are encouraged to apply for grants to host an event during South Australia’s Youth Week 2018. And young people can apply to be the official ambassador, the Young Member, who will play a pivotal role in planning and promoting Youth Week activities at a local and state level. Grants of up to $3000 are available to organisations hosting an event, while an additional $5000 will go to one organisation to host the official launch of the week (13-22 April 2018). Organisations interested in taking part are urged to talk to young people in their communities to find out how they would like to see the week launched and celebrated. Youth Week is the state’s biggest event for people aged 12 to 25. It provides an opportunity to celebrate the diverse backgrounds, interests and ideas that young people have and can contribute to their community, showcased through events. More than 11,000 took part in the 2017 event by planning, delivering or attending events such as wildlife workshops, skate park competitions, yoga and meditation, Open Mic Night, art and music exhibitions and youth forums. The 2018 theme is ‘Your Future – Your Way’ and emphasises the value of young people’s skills and resilience in local communities. The State Government is providing a total of $100,000 in grants. Young people with a passion for their community and working with other young people are urged to apply to become the Young Member so they can play a greater role in shaping the week for all.